Numerous vector stencils, samples and templates created by designers included in the basic bundle of the ConceptDraw DIAGRAM. This is a best professional flowchart software that gives users the ability to simply draw any type of flowcharts. Fast visualization of the structured data with the vector stencils from object libraries by using RapidDraw technology makes ConceptDraw DIAGRAM first in drawing data flow. Sample 1. Flowchart: Invoice payment process. This financial flow chart example shows invoice payment process step-by-step. ConceptDraw DIAGRAM v12 is a very easy-to-use and intuitive database design tool which can save you hundreds of work hours. See database diagram samples created with ConceptDraw DIAGRAM v12 database modeling database diagram software. Data processing can be very complex sometimes. If you are interested in facilitating your work with data, it’s time to learn how to draw flowcharts with special software or using just a piece of paper. The list of flowchart basic symbols includes rectangles, diamond, ellipses etc. and is used to represent processes, actions, decisions or data processing. A well-done flowchart bring the clearness of the sequence of a process stages. There are number of symbols that can be used in flow charts to show various sorts of steps. The basic flowchart can be created using a few of them: Process, Decision, Start/Finish. A basic element of a flowchart represents a simple action and looks like a box, that contains a description of the action. The depicting of actions sequence is made with arrows between corresponding action boxes, as you can see on the sample diagram. Also it shows the symbols for flowchart start and finish steps. 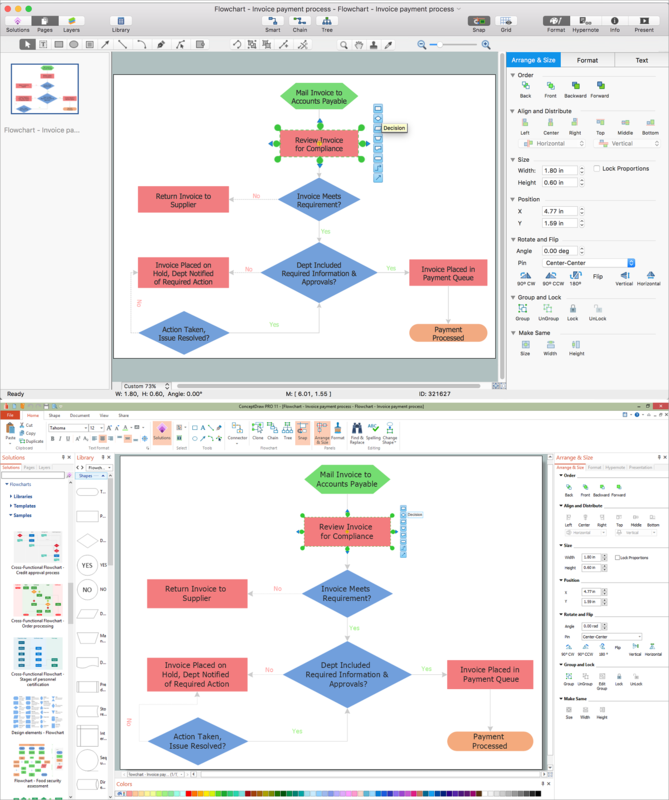 ConceptDraw Flowcharts solution provides the ability to build basic flow charts as well as the ones of any size and complexity with a minimum of actions. Everything about Bookkeeping: Accounting flowchart process. Which symbols to use, how to make a chart.